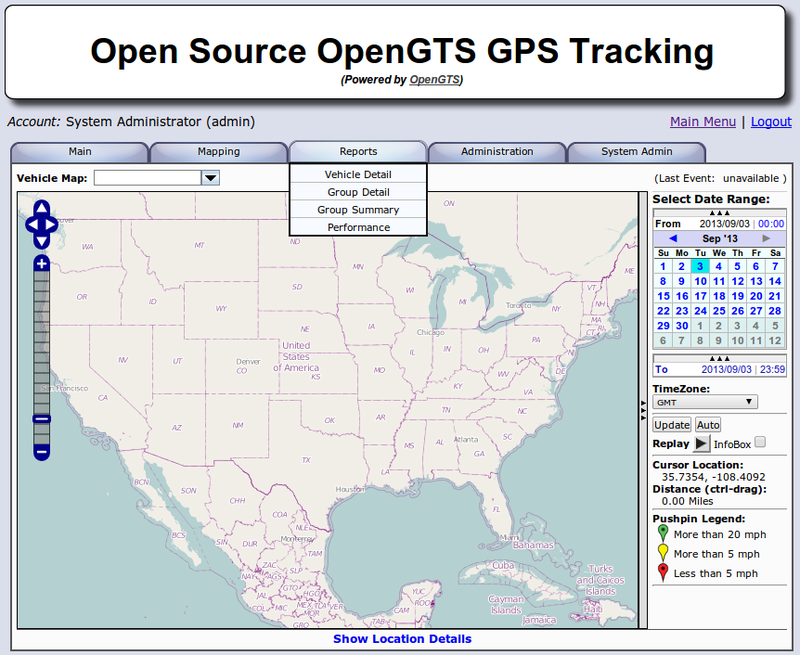 OpenGTS is most popular Java based GPS data processing software. We offer OpenGTS hosting with our Tomcat package (private JVM on cPanel equipped shared server) or any of our VPS packages. Here goes a quick tutorial for running OpenGTS in our Java hosting environment. This is copy&paste style tutorial. Please replace example values with your own before running a command where necessary. 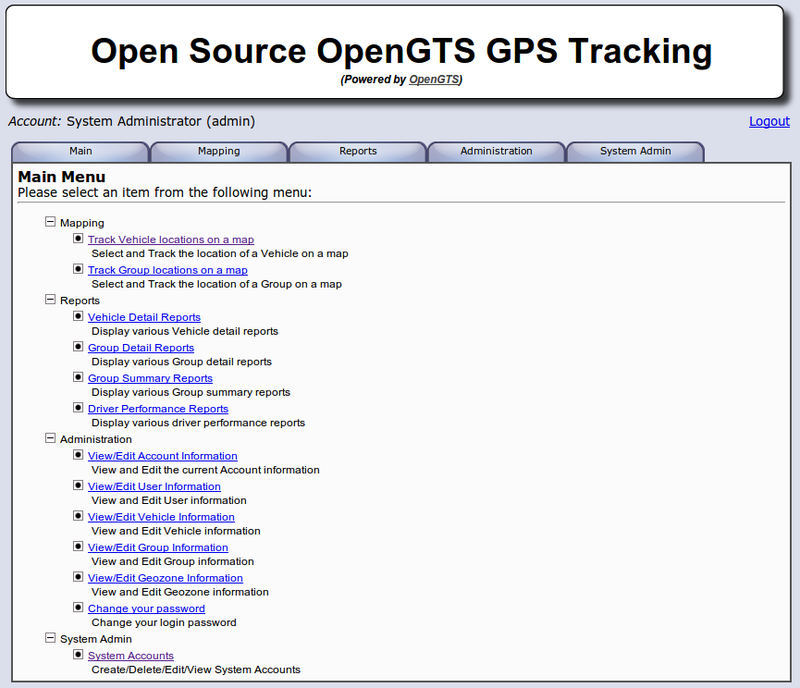 OpenGTS (Open Source GPS Tracking System) is providing web-based service for querying and viewing GPS related data. It can operate independently of any specific GPS tracking device or protocol and comes with support for different protocol formats like OpenDMTP (Open Source Device Monitoring and Tracking Protocol). OpenGTS is fully written in Java and should run fine on any system that fully supports private JVM environment and an SQL database server (like MySQL). Web-based authentication - single account can have multiple users with own set of privileges. GPS tracking device independence - it supports simultaneous tracking of devices from different vendors. Integration with custom devices - you can use template device to write your own code. Own web-page look and feel - match it with your company website. Mapping services - support for OpenLayers, OpenStreetMap, Google Maps, Microsoft Virtual Earth, and Mapstraction and ability to integrate with other mapping service providers. Reports - customize existing and build your own reports showing historical data for a vehicle or fleet. Geozones - provide arrival/departure events on reports. Any operating system - Java gives the system independency, Apache Tomcat provides web service and MySQL stores data. Localization - it is i18n compliant and supports easy localization (L10N) to languages other than English. Download MySQL JDBC driver and JavaMail 1.4.x to $GTS_HOME/jlib/jdbc.mysql and $GTS_HOME/jlib/javamail respectively. We will use GTS_HOME/jlib subdirectories as our ext directory stub because on shared sever writing to $JAVA_HOME/jre/lib/ext is not possible. This change will require modification of a few management scripts where we will reset java.ext.dirs property. Note that JavaMail now (as of 1.5.x) ships as javax.mail.jar instead of mail.jar so using 1.5.x would require a few more changes. Lets copy the jars to Tomcat's lib as the OpenGTS WAR will need them. It will also allow the JavaMail and JDBC driver to be available to all running Java code in the Tomcat environment. You need to restart Tomcat for it to see the new jars. If you are going to use JavaMail 1.5 first correct the code looking for obsolete mail.jar to look for javax.mail.jar instead and not report errors. Just placing javax.mail.jar in ~/OpenGTS_2.5.1/jlib/javamail will not help as we might expect because build.xml contains reference to mail.jar. So the build.xml also needs to be modified for the 2 jars to be found. For the subsequent scripts to run we need to modify java.ext.dirs as on shared server we cannot put jars into $JAVA_HOME/jre/ext/lib. We will set custom java.ext.dirs property in common.pl, common.sh and checkInstall.sh (that does not include any 'common' file). Create database, database user and assign user to the database with ALL privileges in cPanel. Then update OpenGTS_2.5.1/common.conf with the correct values as no root access is available on shared server. Update the below lines with proper values (use your hosting username_ prefix instead of user_) before executing them. Edit your mail account parameters in common.conf. These will be used for sending notifications. Note that it can be also done later in the runtime configuration file custom.conf. Track.war (or other/all WARs) will need to be rebuilt and redeployed. When making changes to confguration (and rebuilding, redeploying WARs) note that the default runtime configuration file is webapp.conf. It in turn includes common.conf. Common.conf includes custom.conf and system.conf. Do not forget to run ant all at the end of this step so that your database credentials are deployed to build directory and will then be consequently used by ant track and similar commands. We will not use initdb.sh as we are on a shared host without root access. Instead we will only create the tables with dbAdmin.pl script. First lines of initdb.sh would create database and a database user with proper privileges. We already did it in cPanel. You can safely ignore Symbolic Link does not exist warning for /usr/local/gts, /usr/local/java and /usr/local/tomcat as it does not apply to shared server. Optionally you can load sample data. We recommend it unless you are expierienced OpenGTS user. for example to set Contact email. events.war can be deployed similarly. Here go 2 screenshots (Main Menu and Vehicle Maps) with the sample data loaded. Now at least we would like to have something real tracked - don't we? For the test we will use Android based smartphone and GPS2OpenGTS_Trial software. The trial runs for 60 minutes. In some circumstances you may need to go outdoor for GPS to determine your location. For Android you may use Google Maps and Find my location to determine if GPS works. The data from a device can come via HTTP protocol, as raw TCP or UDP packets, SMSes or emails and contain NMEA GPRM string. We will use plain old HTTP for data collection. To achieve this we will use gprmc.war servlet to accept and process data sent by the device so there is no need to start a separate socket server (java process). In case you run 2 java processes on shared host (one for track.war and events.war and second for a standalone raw socket DCS service) additional fee may apply. In Administration - Vehicle Admin add new device dev. Optionally edit it and set Unique ID to dev. You should see your device location on the map in Mapping - Vehicle Map right after the first packet from your phone is sent in and accepted. Server name: your domain or alias (username.jvmhost.net) or shared or dedicated IP of the server depending on your setup. Port Number: enter your Tomcat HTTP port here (you can find it in Java Control Panel - Ports). If you specified domain name (not IP) in 'Server name' you can also put port 80 here as it is proxied to Tomcat by default. Start the application. It also has testing mode but note that the tester does not send real GPS data - you may find yourself in a middle of an ocean - anyway OK should be returned. Logs will be in $GTS_HOME/logs/w-gprmc.log. Body : CheckInstall test email sent successfully. A: These are non-harmful generic warnings and you can safely ignore them. The first one can be seen if another OpenGTS instance is running on the same server. Q: I am not able to add user admin from sysadmin account. It showed me the account added but don't logged in and no data for that specific user is entered in the account table. These can be also seen in Track web application. Login as sysadmin and go to Administration - User Admin. Q: I made changes in the webapp.conf file and rebuilt and redeployed track and gprmc but still not been able to receive any data using GPS2OpenGTS, it says Test[RX Send]null. A: Before you go to GPS2OpenGTS tests first use manual tests and see what gets logged in logs/w-gprmc.log. Find a 2 places on Google Maps, let's say one in Chicago and one in Toronto. 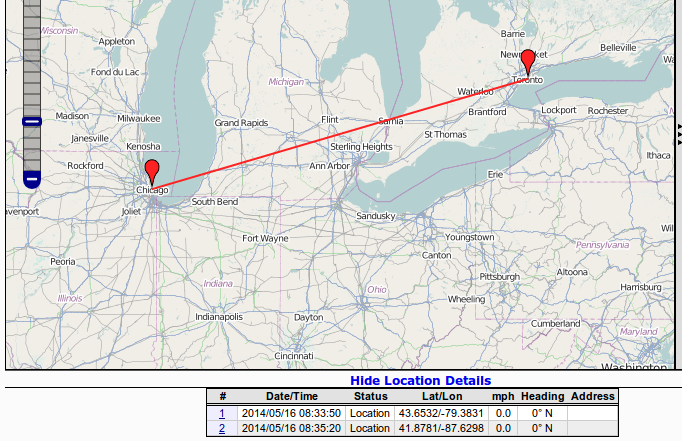 Zoom in Google Maps to a maximum and get decimal coordinates by clicking Link in the left panel. Take decimal latitude and longitude (the numbers following ll= parameter). In our case these are 43.653247,-79.383087. Note the strings include current timestamp and verification code. You may generate new ones if you need different timestamps. The printed result shoud be OK. Alternatively you can call the URLs with your browser. Go to Mapping - Vehicle Map and you should see both locations linked on the map below. and the called URL will be also there. Q: When testing gprmc application I get java.lang.NullPointerException org.opengts.war.gprmc.Data._doWork(Data.java:1017) org.opengts.war.gprmc.Data.doGet(Data.java:874) javax.servlet.http.HttpServlet.service(HttpServlet.java:620) javax.servlet.http.HttpServlet.service(HttpServlet.java:727) and the database does not get updated. A: In OpenGTS 2.5.5 - if you skip batt parameter then you will get the exception. When logged in as sysadmin create a new account 'acct' under System Account. Set a new password for the account. Advanced configuration topics include GeoZones, SMS notifications (for example when a device is entering a GeoZone) via SMS gateway, email notfications, Google Maps API version 3 activation (includng hybrid, traffic, weather and Street View maps, reverse GeoCode service and interface customization. OpenGTS hosting on a VPS server is quite similar and differences will be described in this article later.